My research interests mainly lie in the field of landscape ecology of terrestrial mammals. I am interested in providing reliable tools for the conservation of endangered species, by the development of models aimed at identifying potential suitable habitats, as well as connectivity routes, across landscapes. I obtained my BSc in Biological Sciences and my MSc in EcoBiology at the Sapienza University of Rome. During my master thesis, I had the opportunity to start working on landscape ecology and movement ecology, carrying out a project to produce a connectivity model for the endangered Apennine brown bear. 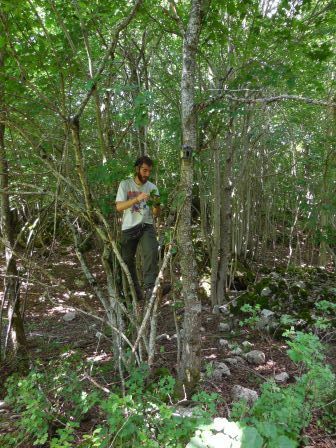 After my graduation, I was employed as research assistant by the Zoological Italian Union in order to continue my work on the Apennine bear, producing a habitat suitability model for the species in central Italy and a new and more accurate connectivity model. I worked for the organization for a year and a half, after which I received a scholarship from my previous University, allowing me to spend a semester in the US working for the United States Forest Service. In this period, I worked on the development of a multi-scale spatial distribution model for the flammulated owl in the Northern Rocky Mountains, and I took part in fieldworks aimed at surveying the Mexican spotted owl in the Grand Canyon National Park. At the WildCRU, I am actually working on the production of suitability models for the number of species sampled across Southeast Asia within the project originally focused on the clouded leopard.